The latest video of violence at a Trump rally may be the most chilling one yet. In the video from last night (you can find it at the end of this post), a black protester gets punched in the face by a white Trump supporter as he’s being escorted off the premises. It’s easy enough to see why these incidents keep happening, and it’s not just because Trump rallies are filled with angry racist shitheads. Now assorted media outlets are reporting that a top Trump aide has assaulted a female reporter. According to the reporter in question, Breitbart’s Michelle Fields, Trump was wandering around talking to reporters after a press conference. She asked him a question about affirmative action. Wait, you may be wondering, did you just tell me that Trump’s campaign manager (allegedly) assaulted a reporter from Breitbart? Lewandowski’s explanation to [Breitbart’s Matthew] Boyle, said these sources, was that he and Fields had never met before and that he didn’t recognize her as a Breitbart reporter, instead mistaking her for an adversarial member of the mainstream media. Oh, ok then, no harm no foul! It seems pretty clear that Breitbart is more interested in its friendly relationship with Trump than it is in the safety of its reporters. And Trump doesn’t seem to care at all that his freaking campaign manager, according to multiple witnesses, physically assaulted a female reporter whose only crime was asking The Donald a question he evidently didn’t want to answer. Racist violence is now a regular feature of Trump rallies. Will actual physical assaults on members of the media by Trump staffers become a thing too? UPDATE: This story just gets uglier by the minute. The Trump campaign is flatly denying that the assault on Fields happened, saying the accusations are “entirely false.” Lewandowski, meanwhile, has accused Fields of being “an attention seeker.” Salon has a useful post with more details. Fields, for her part, Tweeted a photo of the bruises she says are a result of the assault, and Washington Post reporter Ben Terris has provided more details of the assault, which he says he witnessed. Breitbart, whose response to the alleged assault was at first rather tepid, now says (through a spokesperson) that “Breitbart continues to stand 100% with Michelle Fields and believes that Corey Lewandowski must accept responsibility for his actions and apologize.” The “news” site has also suspended a reporter who posted a bunch of Tweets seeming to imply that Fields was making up the assault. Slate has more details and a transcript of the interview. Has anyone else seen Trump talk about the rally in Chicago? Unsurprisingly, he’s trying to put it entirely on the protesters. My people are nice. The people that came there were so nice. We want to get along with everybody and we can get along with people. Oh, you mean the people shouting racist and sexist slurs at protesters? 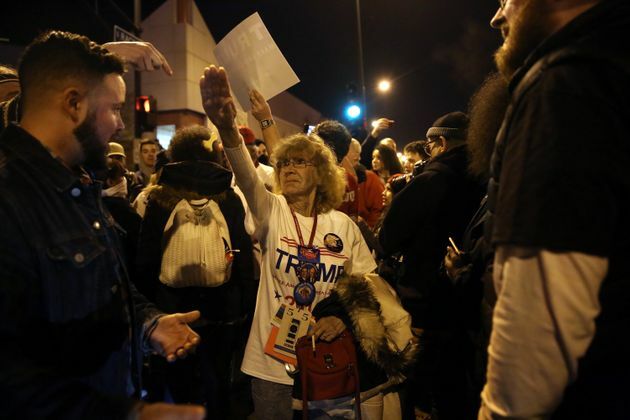 The old lady giving the Nazi salute? The people who tried to rip signs out of protesters hands? The guy who punched someone at an earlier rally this week? What about the guy who was captured on video stabbing a woman with a needle at a different rally!?! I’m not going to say the protesters were entirely innocent. I wasn’t there. I can’t claim that, but Trump definitely can’t say that his people are “nice.” He stirs up their anger and then acts surprised when they are violent. We have a right to speak. I mean, we are law abiding people. We’re people that work very hard. So are the protesters! They have the right to speak too. He’s trying to say that they are all criminals, obviously implying that he meant the black protesters . So, that’s disgusting. There’s also the issue that he lied about discussing the cancellation with police. The Chicago police department has said they they played no part in the decision to cancel the event. You mean like this sweet little old lady? So funny of Teddy Beale to try to pretend she was really a Bernie supporter, too. Especially since no, she’s NOT. She’s one of theirs. And her excuse for what she did ain’t washing, either. Agreed. There’s a lot of attempts to say, “Look at these animals! How aggressive they are!” from Trump fans about the protesters. But as you and others point out, it’s hard to believe that victim narrative. It’s a common tactic with hate groups, isn’t it? Incite violence and when that violence is meet with protests, claim to be the real and/or sole victim. Rachel Maddow filed an excellent report on the rallies and how Trump’s rhetoric “escalated aggression”. http://www.msn.com/en-us/news/politics/trump-claims-man-who-tried-to-rush-stage-connected-to-isis/ar-AAgImXL?li=BBnb4R7&ocid=iehp. And the student protest in the video he uses to back up his ISIS claim took place at my school last year. Oh my God, I definitely dodged a bullet (so to speak, knock on wood it doesn’t actually come to bullets). It is really weird, but Trump is like Heller, Smiler and Beast all put together into one disgusting personality. Second, I always knew as a pessimist that the future we’re going to get is not written by Roddenberry but by Ellis. And here we are, 200 years early and without cool tech to show it. I assume you’re not talking about the lovable furry blue Beast. I can see that. And agreed about the tech. If we’re going to have either Heller or a mutation of Beast, Smiler, and Heller running for president, then we should also have machines that transform garbage into air, ebola cola, and have cured cancer. That’d make the prospect of him becoming president a little more bearable. If only! He’s talking about a man who’s most famous dialog in the Transmetropolitan series is about only having to care about the smallest majority of the citizenry. Which sounded like someone else in 2012, many years after Transmet finished its run. Tragedy of the Commas: I was just hoping that I could transform into a pico cloud before the Smiling Nazi Beast gets sworn in. I’m rather pessimistic right now.